DePaul University President, the Rev. 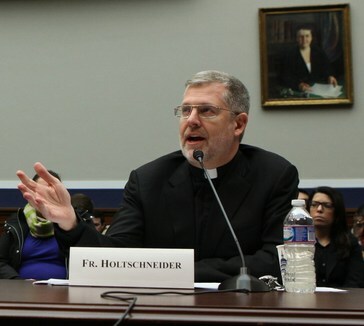 Dennis H. Holtschneider, C.M., speaks at a hearing on education access. Much of Holtschneider’s testimony focused on federal TRIO programs, which provide services for students from disadvantaged backgrounds. He spoke about the success DePaul has seen in two such programs: Student Support Services, which is designed to increase graduation rates for low-income and first-generation college students, and McNair Scholars, which is geared toward preparing students from underrepresented groups for doctoral studies and faculty careers. Holtschneider also proposed ways TRIO programs could be improved nationally to encourage universities to collaborate to better serve students and reduce administrative costs associated with enrolling students in TRIO programs. You are currently browsing the DePaul Advancement News blog archives for January, 2014.